This entry was posted in English and tagged theology. Bookmark the permalink. i sense that u are like me.. a little more visual. maybe? i like the analogy of the bridge in leaflets for ie. 4 spiritual laws., however with concept like the sufficiency of the blood of Christ, i sense that mixing metaphore/symbols can often take us to places where we breach the limits of that particular analogy. Blood is a fluid, with oxygen and other parts which make it unique, ‘the breathe of God’ was given thru His nostrils into Adam etc. There is life in the blood, which is linked to atonement in scriptures. I grew up on a dairy farm and we often also had a few sheep for meat. butchering a lamb for the freezer meant we were a little accustomed to how fragile and awesome life is. Atonement is a complexity, which has also the element of time built into it. Life and time which are both created in an precise ordering of the world’s creation by God. We often hear the term, ‘washed in the blood’ or ‘cleansed by the blood’, which speak of ‘present ongoing’ but based on the one event in Christ’s work on the cross. Atonement is a transference or exchange… this event precedes and supersedes time. It is a finished un-time-limited event. Hebrews says,’a better sacrifice’ than the blood of …..others.. ‘it is finished’., it is a gift already given and the consequence is a reconciliation between God and man. God came to us first. Now, the bridge concept could be limited cos it shows us that there is a equality with us and God that is not limited to this space on one side and the same space on the other… but GOd is person and we are person. ie. Is GOd equal to us and the gap the same both sides? So yes there is a gap.. but it is a gap between persons., that reunion is greater than anything we could imagine and not just stepping over a ditch…it’s closer to maybe a trodden leaf being regrafted back into the tree,the proportion is massively dif. So i would fall back on maybe an image of the master gardener grafting us back into the tree as a better analogy… or being washed and presented to meet the King with new clothes… it’s more personal and has relationship built in. We require faith to enter the King’s court, but still have to have our body and garments washed and prepared before we can enter. The prodigal son’s father who ran in front of all neighbors to hug his son and welcome him home, immediately put a new robe on him. there are lots of images…. . mmm not sure if this is clear, something to chew on? Hey there! Fantastic site! 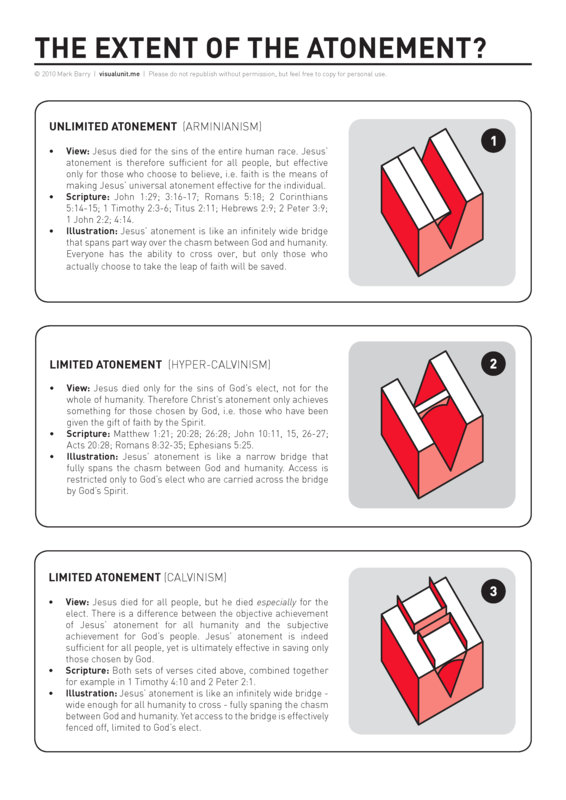 Might I ask if you would consider a version of this where the top one (or a fourth) has a fully-spanned bridge all the way, and have the text talk not about a “jump”, but merely crossing it (active faith)? I am an Orthodox Christian, with a Baptist and Reformed background, so I try to give the Orthodox perspective wherever I can 🙂 Keep up the good work! Hi! Just a quick comment if I may: not sure if “Hyper-Calvinism” is the best label for the second option. I think there would be many “5-point Calvinists” who would prefer your wording associated with option 2, but I don’t think they would really be in the category of “Hyper-Calvinists”. It is hard to pick best terms, but perhaps other alternatives might be to distinguish between “high” and “low” Calvinists, or perhaps “broad” and “strict” Calvinists, or some other such..? Fair comment, Craig. Though I do believe that Calvin would actually hold to the last option, i.e. trying to make sense of all the scriptural texts and attempting to hold these truths in tension, rather than over-emphasising one particular set of verses and so going beyond the teaching of the Bible (=Hyper-Calvinism). But I’m sure many people would take me to task on that! Yeah, I’m not sure Calvin is so clear on that point.. I have an old friend (who is active on the web about it, and recently published articles about it) whom I have discussed this with at length and not really agreed 🙂 For example, if you look at Calvin’s comments on all the passages you cited in both Option 2 & Option 3, I think it is hardly clear which side he falls on. Also, it gets murkier if you factor in Calvin’s strong views on election and predestination, which I think would tend more to the higher side than the lower side, when compared to those of modern “Calvinists”. Calvin certainly isn’t as clear about this issue as modern day “Calvinists” tend to be.